Truly back to nature – the islands around the Angthong Marine Park feature truly well preserved huge corals, a wide diversity of marine life, and stunning scenery above the water too. A relaxing and rewarding day out for divers, snorkelers or just chill-buddies on the boat. 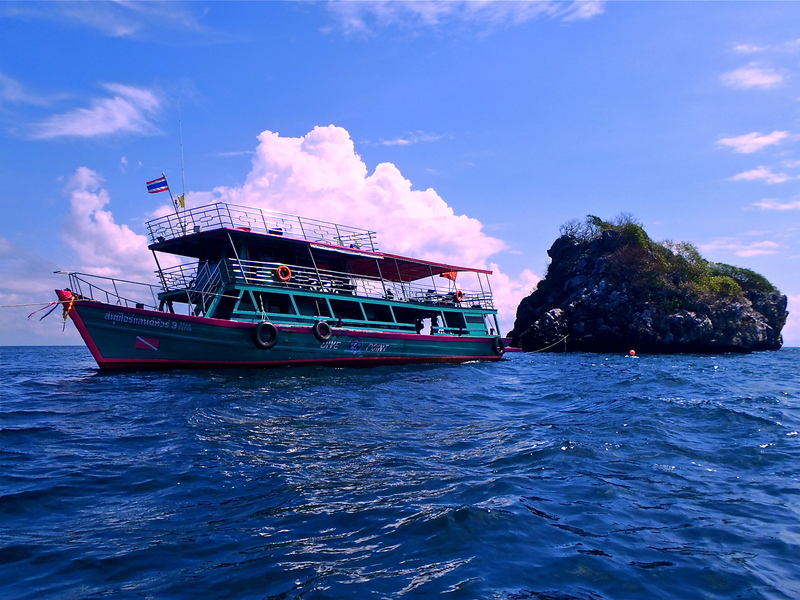 Taking a tour to the Marine National Park is a fantastic day out for the family, this is where you find the greatest biodiversity in the gulf of Thailand. Taking our boat from Koh Samui the journey takes around 2 and a half hours or so, all of which will be a pleasurable experience enjoying the scenery and chilling. Aside from the beautiful topside scenery, the underwater world here can be the most varied and interesting. Divers can find Giant barracuda, huge schools of fusiliers, oddities like razor fish, cuttlefish, sea snake and big families of anemone fish. The diversity of hard and soft corals is mesmerizing, with gardens of this marine animal almost everywhere you turn. Nudibranchs are abundant here so if these little creatures interest you, you will find many varied species. Snorkelers can expect beautiful scenery both above and below water, everything is shallow, including a few sea caverns for the more adventurous. Currents can be appreciable around the full moon, but with so many dive sites on offer we can always find a pleasant area for diving and snorkeling. Visibility can range from 5-8m to over 30m, yet the Dive sites remain dive able all year round. With Koh Wao and Koh Yippon we are one of only a handful of operators who visit these islands, this means that you normally have the site all to yourself. Maximum depths are fine for all levels of diver from first time Try Dives and up. Every level of diver or snorkeler will have FUN here!